EE, the UK’s biggest mobile operator and part of BT Group, announced today that all of its EE Pay Monthly, Pay As You Go, Broadband and TV customer service calls are now being answered by customer service staff in the UK and Ireland. The move marks the latest in a line of initiatives EE has introduced in its drive to become number one for service in the UK mobile industry. 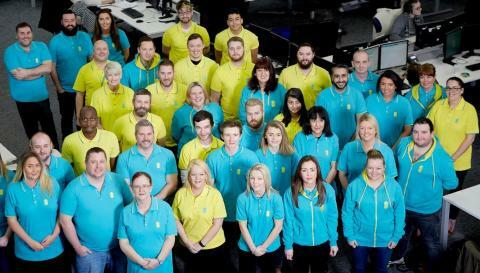 As part of the move, EE has created over 1,000 new jobs in the UK and Ireland across its North Tyneside, Darlington, Plymouth and Merthyr Tydfil sites. Customers are already benefitting from the latest updates to the My EE app, which provides people with even more flexibility and control over their account, including checking data usage, available allowances and add-ons, as well as getting advice on everything from how to pay their bills to checking their balance on-the-go. In late 2016, EE also launched an innovative Network Status Checker tool to provide real-time and personal updates to customers about network performance. Customers can set tailored alerts for places that are important to them, such as their place of work, their home or the home of a loved one, and they will receive personalised alerts if there are network issues. EE runs the UK's biggest and fastest mobile network, having pioneered the UK's first superfast 4G mobile service in October 2012, and was the first European operator to surpass 14 million 4G customers in December 2015. EE has more than 550 shops across the UK. EE's 4G coverage today reaches three quarters of the UK’s landmass. EE plans to extend 4G to 95% geographic coverage by 2020.